Okay, let’s get to it. This post involves no humor at all – only sadness. 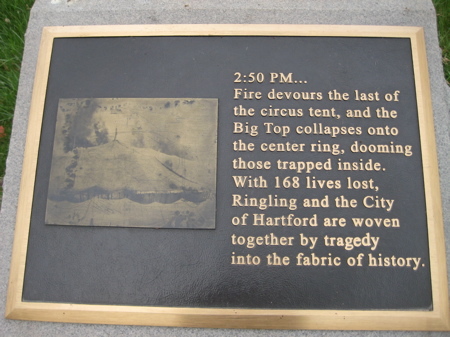 After all, the Hartford circus fire is the worst disaster in Hartford history and one of the worst fires in the history of the US. (I’m sure someone could argue that snaking I-84 through the center of the city and burying the Park River was worse, but I see the two tragedies as bad apples and awful oranges.) 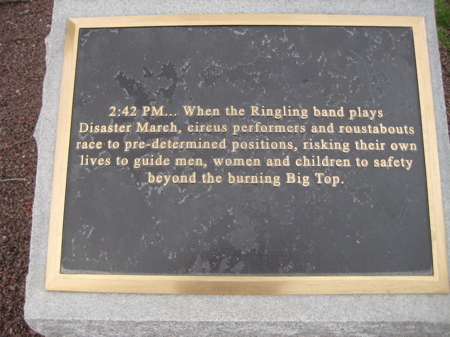 The fire occurred on July 6, 1944, during a performance of the Ringling Bros. and Barnum & Bailey circus in the city’s north end. Most everyone who lives around Hartford knows something about the fire. CPTV shows their show about the fire every few months and it’s a very well-known part of Connecticut history. I’m pleased to report that the memorial itself is very well done and appears to be well-cared for. The fire began as a small flame about twenty minutes into the show, on the southwest sidewall of the tent, while the Great Wallendas were on. Circus Bandleader Merle Evans is said to be the person who first spotted the flames, and immediately directed the band to play “Stars and Stripes Forever”, the tune that traditionally signaled distress to all circus personnel. Ringmaster Fred Bradna urged the audience not to panic and to leave in an orderly fashion, but the power failed and he could not be heard. Bradna and the ushers unsuccessfully tried to maintain some order as the panicked crowd tried to flee the big top. Sources and investigators differ on how many people were killed and injured. Various people and organizations say it was 167, 168, or 169 persons (the 168 figure is usually based on official tallies that included a collection of body parts that were listed as a “victim”) with official treated injury estimates running over 700 people. The number of actual injuries is believed to be higher than those figures, since many people were seen that day heading home in shock without seeking treatment in the city. 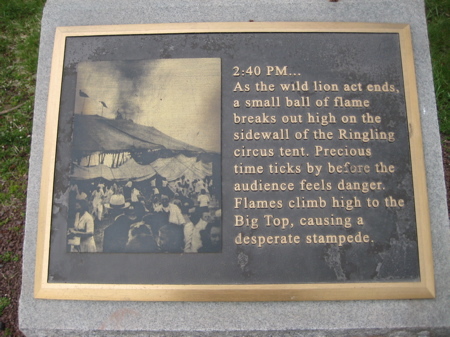 The only animals in the big top at the time were the big cats trained by May Kovar and Joseph Walsh that had just finished performing when the fire started. The big cats were herded through the chutes leading from the performing cages to several cage wagons, and were unharmed except for a few minor burns. The cause of the fire remains unproven. Investigators at the time believed it was caused by a carelessly flicked cigarette but others suspected an arsonist. Several years later while being investigated on other arson charges, Robert Dale Segee (1929–1997) who was an adolescent roustabout at the time, confessed to starting the blaze. He was never tried for the crime and later recanted his confession. Because the big top tent had been coated with 1,800 lbs of paraffin dissolved in 6,000 gallons of gasoline (some sources say kerosene), a common waterproofing method of the time, the flames spread rapidly. Many people were badly burned by the melting paraffin, which rained down like napalm from the roof. The fiery tent collapsed in about eight minutes according to eyewitness survivors, trapping hundreds of spectators beneath it. The circus had been experiencing shortages of personnel and equipment due to World War II. Delays and malfunctions in the ordinarily smooth order of the circus had become commonplace. Two years earlier, on August 4, 1942, a fire had broken out in the menagerie, killing a number of animals. 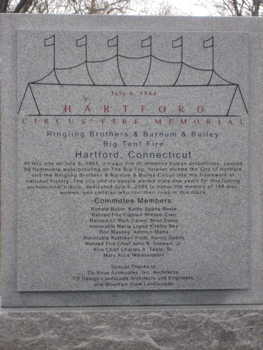 Circus personnel were concerned about the 1944 Hartford show for other reasons. Two shows had been scheduled for July 5, but the first had to be canceled because the circus trains arrived late and the circus could not set up in time. In circus superstition, missing a show is considered extremely bad luck, and although the July 5 evening show ran as planned, many circus employees may have been on their guard, half-expecting an emergency or catastrophe. 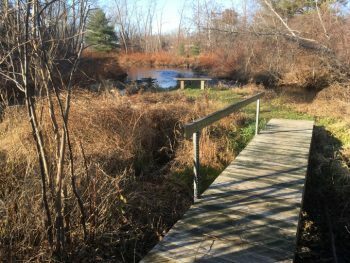 It is commonly believed that the number of fatalities is higher than the estimates given, due to poorly kept residency records in rural towns, and the fact that some smaller remains were never identified or claimed. It is also believed that the intense heat from the fire combined with the accelerants, the paraffin and gasoline, could have incinerated people completely, as in cremation, leaving no substantial physical evidence behind. 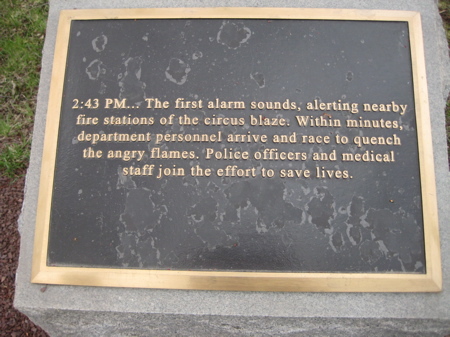 Additionally, free tickets had been handed out that day to many people in and around the city, some of whom appeared to eyewitnesses and circus employees to be drifters, who would never have been reported missing by anyone if they were killed in the disaster. The number of people in the audience that day has never been established with certainty, but the closest estimate is about 7,000. While many people were burned to death by the fire, many others died as a result of the ensuing chaos. Though most spectators were able to escape the fire, many people were caught up in the hysteria and panicked. Witnesses said some people simply ran around in circles trying to find their loved ones, rather than trying to escape the burning tent. Some escaped but ran back inside to find family members. Others stayed in their seats until it was too late, assuming that the fire would be put out promptly, and the show would continue. Because at least two of the exits were blocked, by the chutes used to bring the large felines in and out of the tent, people trying to escape could not bypass them. Some died from injuries sustained after leaping from the tops of the bleachers in hopes they could escape under the sides of the tent, though that method of escape ended up killing more people than it saved. 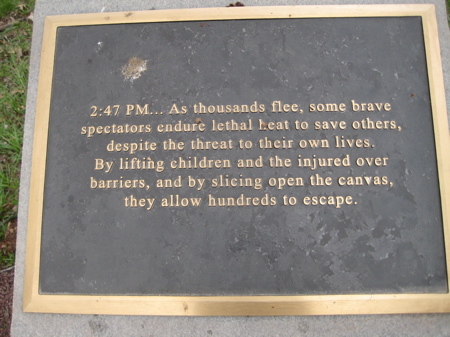 Others died after being trampled by other spectators, with some asphyxiating underneath the piles of people who had fallen down over each other. Awful. But here’s a kooky fact: Charles Nelson Reilly was a circus fire survivor and as a result, it is claimed that he never sat in an audience ever again in his life. The lot where the circus performed—bounded by Barbour Street, Cleveland Avenue, Hampton Street and Kensington Street—eventually became the site of the Stowe Village housing project. 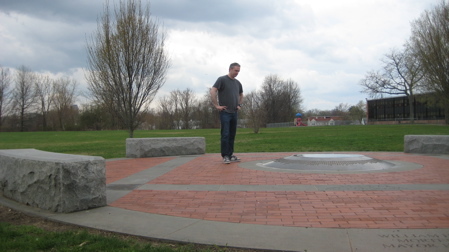 On July 6, 2005, the 61st anniversary of the fire, several hundred people, including survivors of the fire and relatives of the victims, attended the dedication ceremony for a memorial created in a field behind the Fred D. Wish Elementary school. 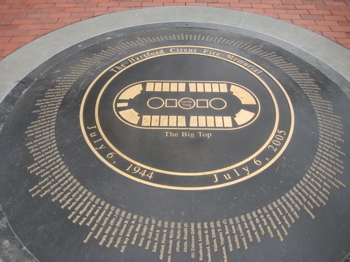 Laid out to mark the exact location of the tent that burned, the memorial features a “center ring” consisting of four granite benches and a bronze disk bearing names of the victims and their ages. Flowering dogwoods mark the location of the side and end walls of the tent. My Dad, Oswin H. Doolittle and I were at the Hartford Water Bureau testing water when the water meters dropped down indicating that a huge use of water was taking place. We were going to go to the Circus when we finished our work that day. I remember the photos of the little girl “Little Miss Hartford” because her name could not be learned and no one claimed her body. We’d watched the raising the the tent the day before; a very sad time indeed. I was in that fire and carried out by an uncle and held up in front of St. Francis Hospital so my mother who was there could see I was O.K. Am now 73 and still do not like crowds. Remember bits and pieces but that is all. My mother, Carolyn Keller, and my mother’s sister, Marion Keller, took my brother Bob, cousin Pete and me (now in our 70s) to the circus that day and we all survived. I was picked up by a roustabout and carried through a hole in the tent to safety outside. Still recall looking up and seeing burning pieces of the tent coming down around us during the escape. Where can I find a list online of the victims of the fire. I think 4 of my relatives died there and I would like to know if they did. How can I find out in advance what commemorations are planned for survivors in July 2014? It is the 70th anniversary! Is any gathering or observance in the works for Sat., July 5 or Sun., July 6, 2014 ?? My mother, Evelyn Killian, was a public health nurse and was assigned the duty of supervising the morgue. She forbade our family attending any tent shows, a rule we followed until I got a temporary job in 1967 as a side show magician with Clyde Beatty Cole Bros Circus, the last major touring circus under a big top. My dad was at the circus fire, after sneeking in with a buddy. He was 12. He passed in 1994, but rarely spoke of that day. He forbad his children from any “tent” event, and if there was one, we were not allowed to go in. He never got over that day. My Dad worked nights and had promised me to get up early and take me (then 7 yrs. old )to the circus. We lived on Woodstock St just around the corner of the main street leading to the circus and coming from the fire dept. and the hospital. First thing I remember was sirens and fire trucks and ambulances flying past our street. Then one of our neighbors who had been there came running up the street and told us what had happened. We then went to the hospital with another neighbor to see if her teenage son and sister were there. Will never forget all the victims laying on tarps on the lawn and the awful smell of burned flesh. Thank God her children had only minor injuries and my Dad had overslept. My Dad took me to the circus the day before the fire. he returned the day of the disaster and he escaped u injured he then was asked to take folks to the hospitals in his car. But that is all I know. He passes in 1968 . I will be 74 in May. There needs a way for people today to go there to pay respects to a part of CT history now in the Northend with out fear of any bad happening. Is that possible over 72 Yrs later! Is it possible?? ?